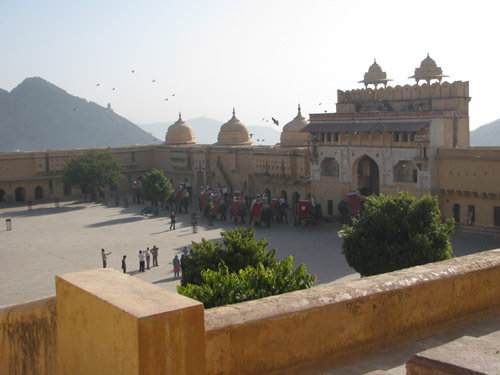 Amber Fort is a major tourist attraction, receiving about a million and a half visitors a year. 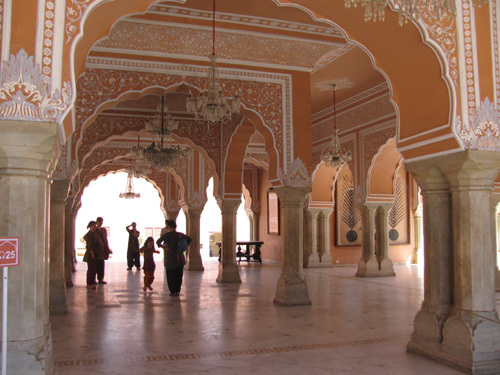 Inside is a complex of buildings and palaces. 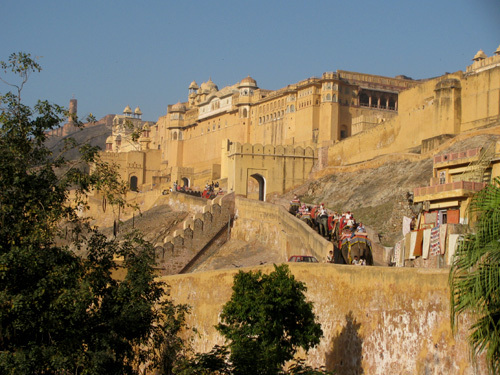 There is a subterranean passage linking it to the Jaigarh Fort on the hill above it. 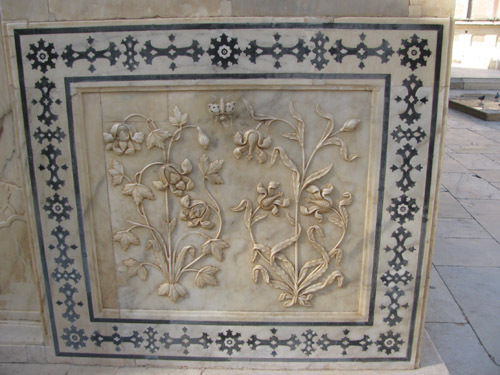 The beautifully painted Ganesh Pol. 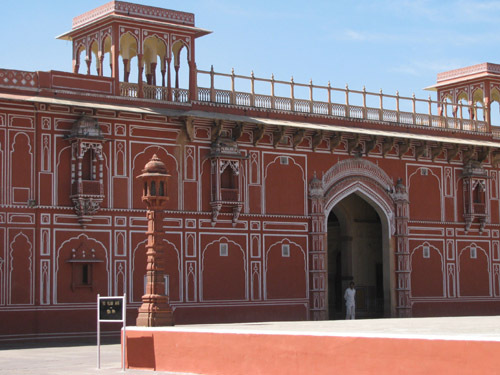 Pol means gate in Hindi. 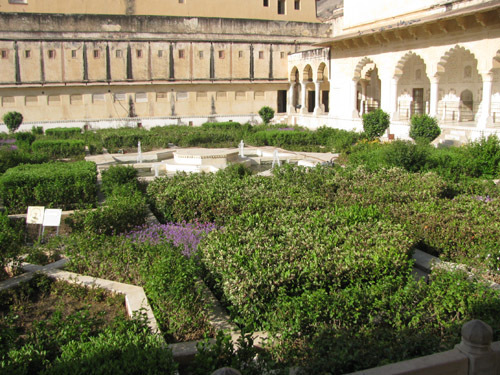 The garden on the second level. 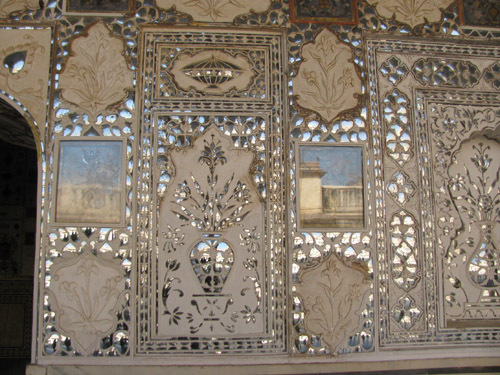 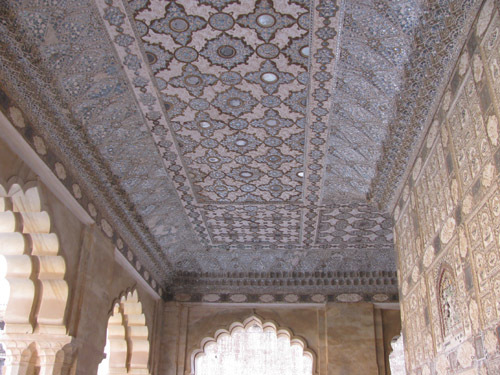 Sheesh Mahal, the Palace of Mirrors. 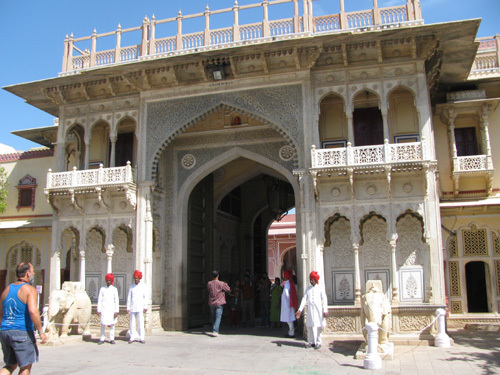 This entry was posted on August 31, 2011, in fort, India, Jaipur, Rajasthan. 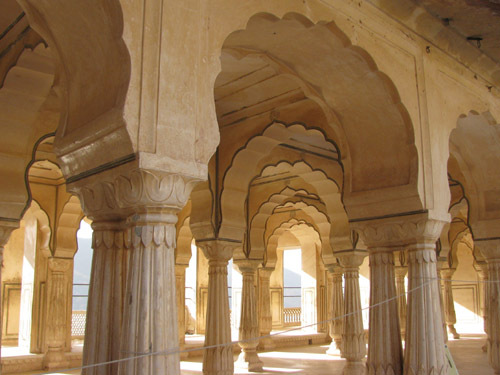 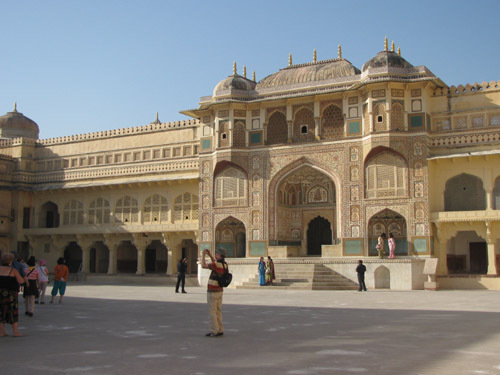 Amber Fort, eleven kilometers from Jaipur, was originally a complex of palaces built in 1592 which was later fortified. 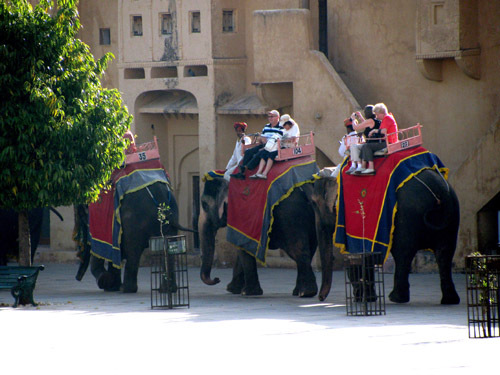 Visitors can arrive by elephant or, if the elephants are not available, by taxi at the rear entrance. 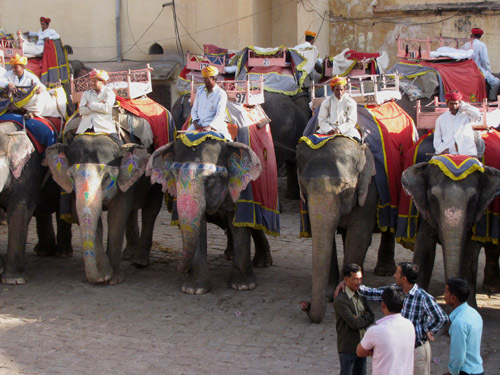 Prem got us there a half hour after the palace opened, and the line waiting for the elephant ride was already impressively long. 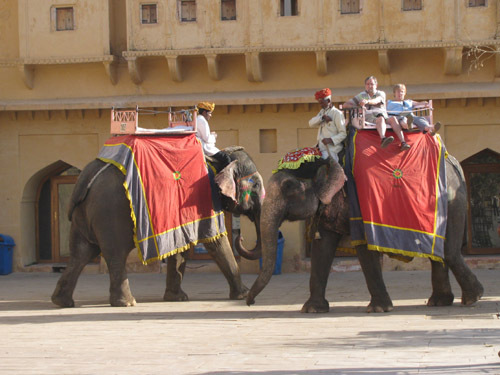 It moved quickly, but the bad thing about it was you were a captive audience for the many peddlers very aggressively hawking their goods. 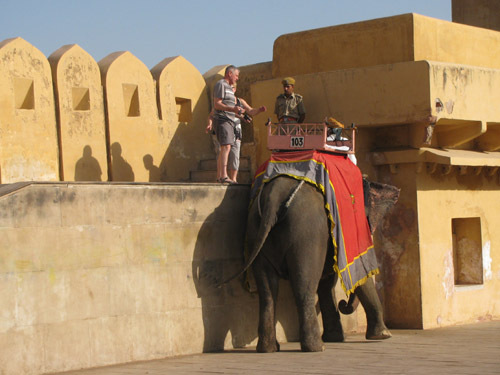 The line moved up a flight of stairs to a platform where you could easily flop onto the seat atop the elephant’s back. 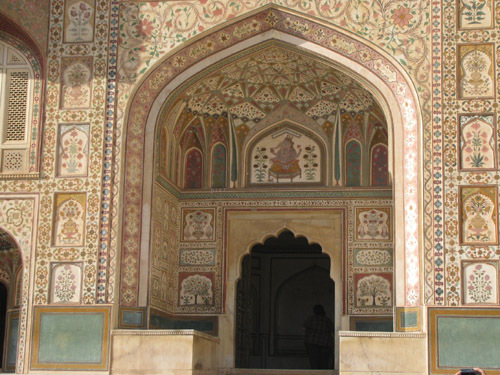 Even on the ride up, you had guys on the walls along the way hollering at you. 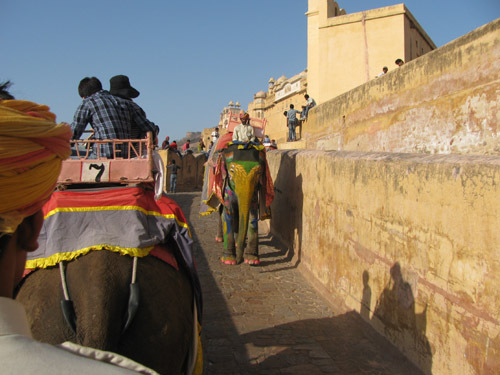 Really, does anyone ever stop their elephant on this busy path to do a little shopping? 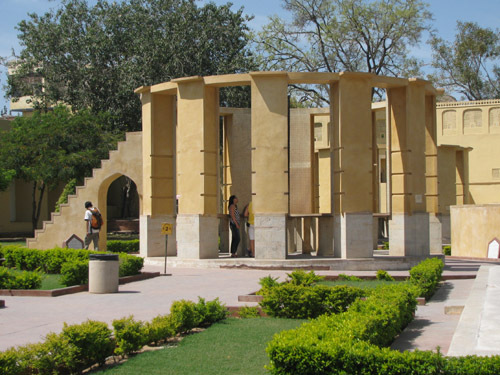 In spite of the touts, it was a fun experience, and I’m glad I did it. 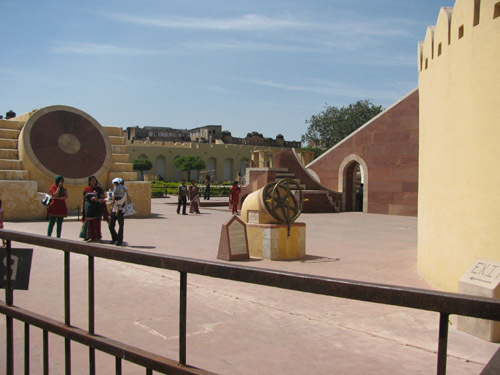 The dismount platform inside the fort. 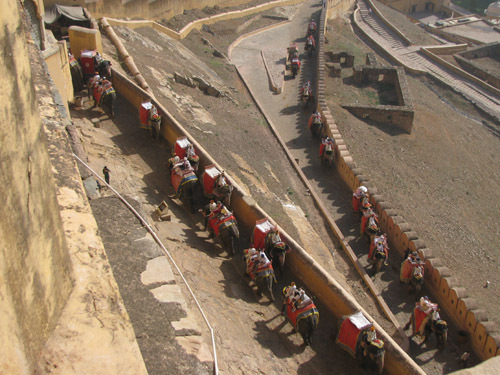 A stream of visitors arrives at the fort by elephant. 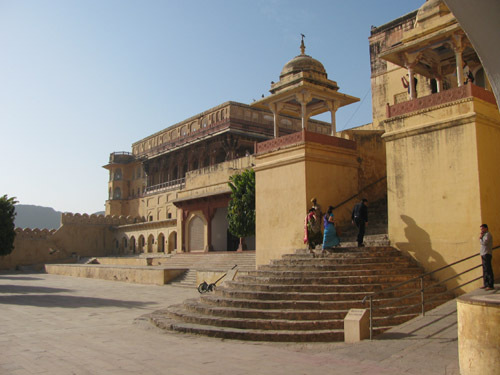 This entry was posted on August 29, 2011, in fort, India, Jaipur, Rajasthan. 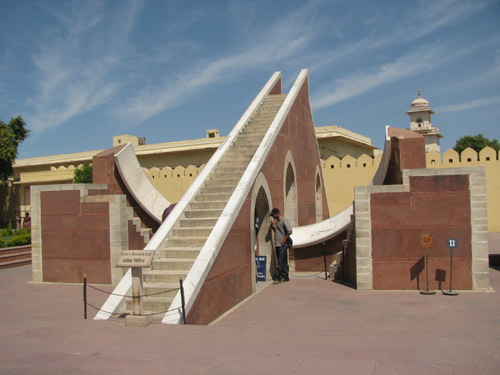 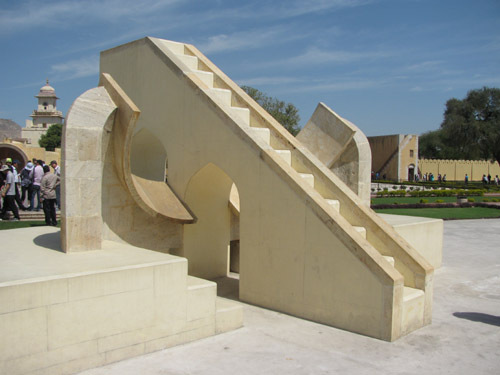 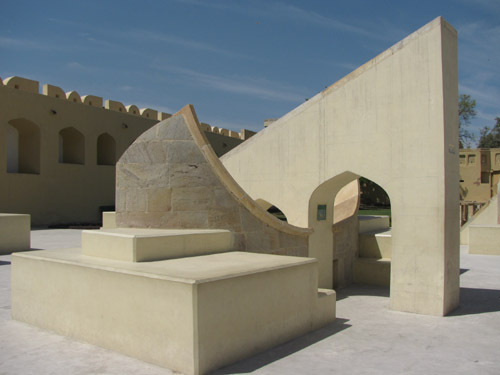 Jantar Mantar is an astronomical observatory built by Maharajah Jai Singh II between 1727 and 1734. 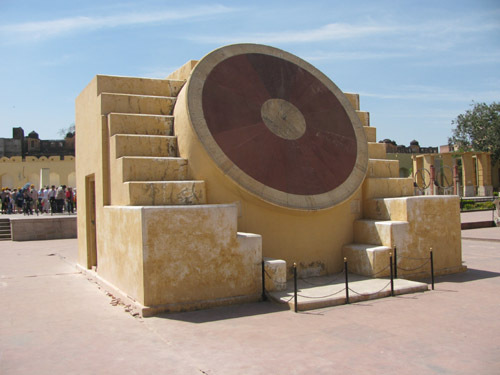 There are 14 structures in it which were used to measure time, predict eclipses and determine the locations of stars. 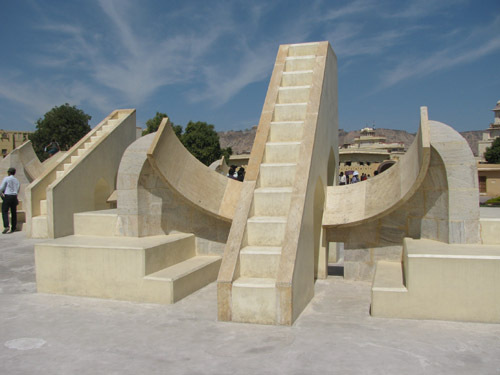 Some of the structures represent specific constellations. 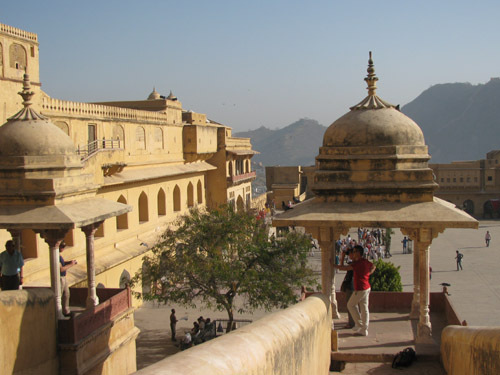 This entry was posted on August 26, 2011, in India, Jaipur, Rajasthan. 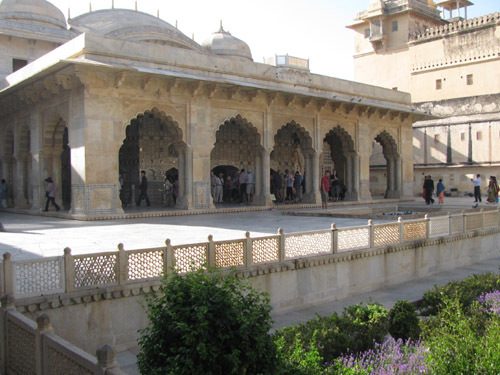 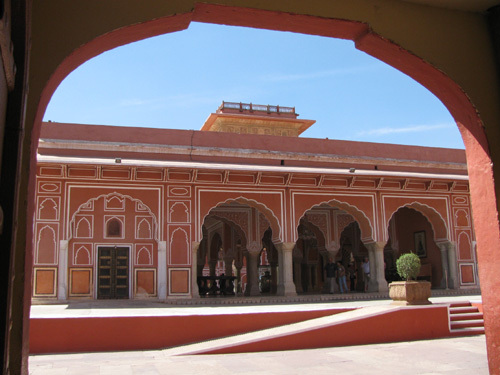 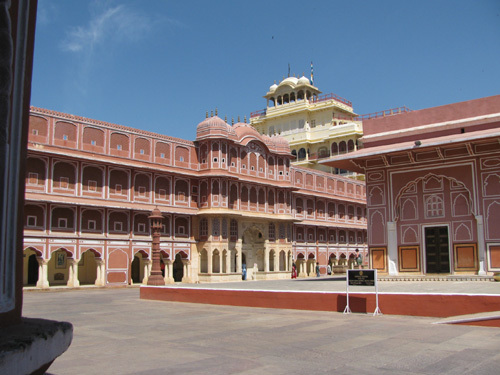 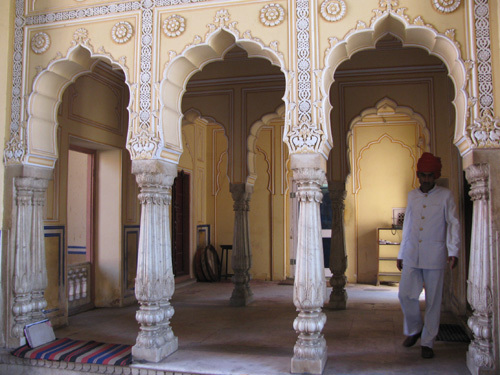 Jaipur City Palace is a cluster of beautiful buildings built sometime between 1729 and 1732. 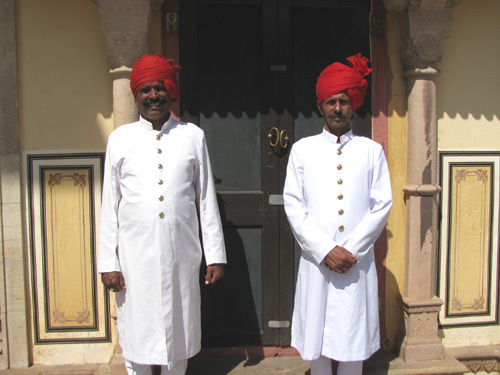 These guys smile patiently for tourist snapshots all day long. 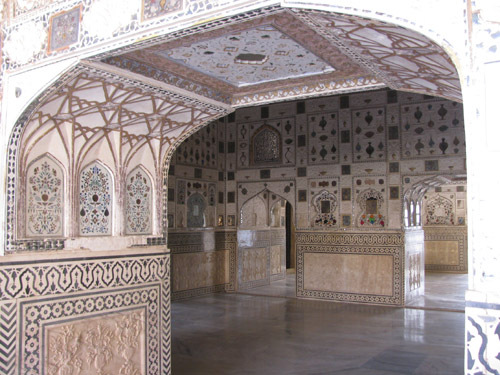 Diwan-I-Khas, Hall of Private Audience, where the Maharajah would meet with nobles.